Taking the First Step into Space or Making a Rocket Powered Fence Post Hole Digger? The following text was taken, with permission, from an article by by Gregory Allison, which was published in the May-June 1996 issue of the Southeastern Space Supporter, newsletter of HAL5. Who said 13 was an unlucky number? 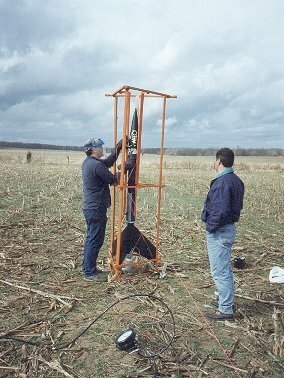 There we stood in a windswept cornfield near Manchester, Tennessee on Saturday, the 13th of April, with the HALO rocket stowed in its launch gondola in the back of Al Wright's pickup truck. Wind gusts were so bad that the local volunteer fire department, which was running a barbecue concession for the event had to take down their canopy. Then, a heavy rainstorm swept in followed by more wind. The wind was almost steady with a few breaks of just four or five minutes. Our launch window was only open from 2 to 4 pm. Launch conditions did not appear to be optimal. We feared that any gust of wind catching our oversized fins (designed for a one percent atmosphere) would pitch our rocket horizontal to the horizon converting it into an unguided ground strafing cruise missile! Well of course that wouldn't do! What to do?!? As it approached the time we would have to initiate setup, I polled all the HALO experts. With hands stuffed into pockets and feet kicking at the dirt and cornstalks I got the resounding response: silence. Tim Pickens, anxious about the weather, looked at me and said, "You guys (HAL5 Executive Committee, I suppose?) tell me what to do, it's your decision", or something like that. I looked across the field into the faces of all our members present and thought of all the work they had done and sacrifice they had made for this day. To quit now would have crushed all their spirits. I knew we owed it to them to at least try to set for launch and hope for a miracle break in the weather. I looked at Tim and uttered the mundane response, "No Guts -- No Glory! Let us at least set up and then we'll see what happens." The rain had stopped so everyone cheerfully pitched in to initiate setup. We pulled the plastic off the rocket/gondola launch system and transported it to our designated launch area. (Launch site director, Rick Kauffman had specified a separate launch site for us so that other groups could continue launch activities with little regard to our schedule.) We took a few photographs with the rocket and proceeded to integrate the avionics. We discovered a connector problem and discovered we had to drill an additional hole. Time was ticking and the launch window was eroding. The avionics were integrated, the rocket reinstalled into the gondola (launch tube) the system was erected and staked down. Then -- more rain! We rushed to cover the rocket with a plastic tarp while Al Wright and Tim Pickens prepared to load the liquid nitrous oxide oxidizer. There we all stood, in the rain, working and preparing for the dubious chance that we might actually fly this bird. Loading was proceeding slowly and the launch window was ticking down. I commandeered Clay Sawyer's car (which was at our launch site) and went to Rick Kauffman to plead for ten extra minutes. As it turned out he had 30 minutes of reserve, keeping our window open until 4:30 pm. A few minutes before 4:00 pm, as the nitrous oxide loading was nearing completion, the clouds broke and our spirits lifted. Tim Pickens and Al Wright, who had been loading the nitrous oxide attempted to close the gaseous vent valve. In order to maximize liquid oxidizer content in the tanks a gaseous vent valve is necessary to get rid of gaseous phase oxidizer. Unfortunately, due to the expansion of the exiting gasses there was an ice build up on the valve and several adjacent components. Tim and Al each struggled with two laborious attempts to close the valve -- no success. Meanwhile, supercold leaking nitrous gas caused the bottom three inches of the nose cone to frost over. Al and Tim both recommended we scrub the flight. Once again I looked around the field into all those now distant faces bearing great expectations. It was as if something deep inside told me was to fly that day. "Tim", I said, "try it just one more time." With a look of total determination on his face, a picture forever locked into my mind, Tim once more set himself upon the task. I said a little prayer. The valve began to move -- it closed! AT LAST! The hook-ups were removed and we all walked or drove quickly to our launch positions. 4:05 pm. The wind and rain had finally stopped. A big round patch of beautiful blue sky hovered over us, as if sent by God. I handed the fire control box to Al Wright. A large passenger jet flew overhead. Though we had a high altitude launch window from the FAA we were instructed to watch for aircraft and to not fly into clouds that could block visibility of such aircraft. The plane passed over. Al switched the safety shunt off, counted down and threw the fire switch -- nothing happened. We all waited spellbound -- long enough to permit a cook-off of the igniter. Again -- nothing. Amazed, we switched the safety shunt back on. 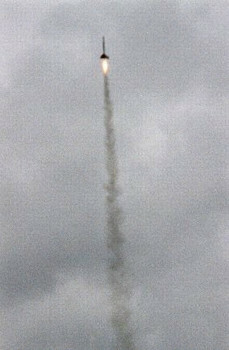 Drew Prentice, president of Hybridine Aerospace Corporation (and HAL5 member from Georgia) was first to reach the HALO rocket. Tim Pickens, Al Wright, and I were close behind. We all fully understood that we were approaching a potential hot bomb that we might never walk away from. The operative word was "mission". At that moment that was all that counted. Battery leads were tightened, voltage checks were made. It seemed we had isolated the problem. Once again we hurried to our launch positions. I took the launch control box. Another large passenger jet had just passed overhead. I threw the safety shunt switch off, counted down and threw the fire switch -- nothing happened, again! We all stood in amazed silence. How could this be? I wondered if the switches were cross wired (they were not). I began to toggle the firing switch and the safety shunt switch alternately to see what would happen. I looked up at the rocket as my hopes were falling through my chest, when suddenly -- WHOOSH! -- the rocket SCREAMED skyward! We saw it cavort a bit, shed a few black objects which we assumed were fins, spin stabilize, and climb straight into the sky! It disappeared in less than 20 seconds. The launch time? 4:13 pm! Who said 13 was an unlucky number? It looks like our HALO rocket flew over 30,000 feet. Performance exceeded expectations! The basic message that comes across to me is that greatness lies at the ragged edge of the undoable. When it can' be done -- you just have to push through it! Ad Astra!